Schloss Münchenwiler - situated not far from the historical town of Murten - is set amid a spacious park. Here you can immerse yourself in the dignified atmosphere of manorial times. 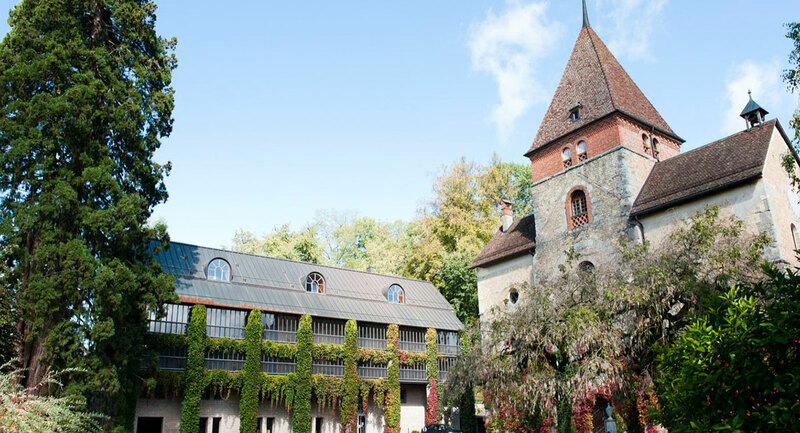 Founded as a Cluniac priory and later expanded to become a feudal Bernese residence, today we welcome you to a historical palace with modern appointments. The most dominant trees in the castle area are the sequoia trees, which replaced the northwestern tower of 1537, which disintegrated in 1850. Their age is approx. 150 years with a height of approx. 45 meters, standing under village protection and provided with lightning conductors.There are very old trees near the well which have an estimated age of over 200 years. The larches above the vaulted cellar have optimal growing conditions due to the uniform moisture of the sandstone and the good air supply to the roots. The larches cling to the cellar vault. Due to these optimal conditions, they are about 50% larger (trunk diameter) than larches planted in the forest at the same time. In the 18th and 19th century, with the owners' stays abroad, a preference for exotic trees arose. Examples are the Serbian spruce, the sickle fir, the metasequoias and the walk-in Thuja tree of life. Our herb garden has been a vegetable garden for centuries, created by the Cluniac monks, later cultivated by various lords and today indispensable for our kitchen team. This treasure chest houses over 200 different plants; from the common to the rare, regionally known and brought from distant countries. We look forward to preserving this beautiful heritage, enriching the castle's cuisine and making the herb garden available to them as a place of sensual experience. Historical swimming pond, which can be used for swimming in summer.